An always up-to-date inventory of all your SharePoint and Office 365 applications is the basis for informed decision making. 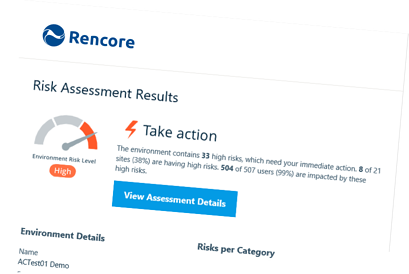 Take our Free Risk Assessment to learn about all your SharePoint applications and the risks they pose to your organization. Not knowing where and when applications are introduced to an organization’s SharePoint environment makes it hard to track and determine their security. Undiscovered risks lead to loss of intellectual property, legal fines, and a competitive disadvantage. Make an action plan today to find out what applications you have in your environment.